Before we start talking about the importance of site prep, let’s define what it is. Site prep involves planning the best route for the various trades to get in and out of your house with the least amount of disruption and providing the necessary protection for your home during the process. While most remodeling projects don’t require the homeowner to move out of their home, some projects involve considerable square footage or a critical area of the home such as the kitchen. 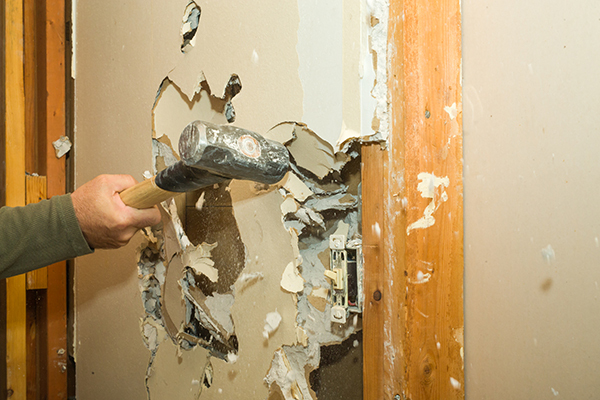 Unlike what we see on home improvement TV, remodeling projects can take weeks or even months to complete. This requires that the site prep be done meticulously. A roll of duct tape and some plastic sheeting may not cut the mustard for a multi-month remodel project. Now let’s talk about some of the critical protections that should be taken during site prep. When considering how to protect your existing floors during a remodel, you need to first consider what type of flooring you are wanting to protect. Carpet – Construction traffic on existing carpet can be detrimental but a simple carpet protection film will help seal out most of the dust and debris. Depending on the type of carpet and protection needed, painter’s drop cloths can work for the duration of a project as well. Hardwood floors – To protect hardwood floors, a product called “ram board” or a heavy-duty cardboard roll should be used. Ram board can be taped down, but make sure your contractor ensures the tape’s adhesive doesn’t take the finish off your floors. Painter’s drop cloths on hardwoods can slippery, so I wouldn’t recommend that option. Tile floors– Ram board can also be a good option for tile floors as well as construction carpet runners. You’ll want to feel comfortable that if something like a hammer gets dropped on the tile that the protection is thick enough and durable enough to prevent cracking. If any walls are being removed or new walls installed, you’ll want to make sure your contractor is planning for dust control. During demolition and construction, temporary dust protection walls need to seal tight to the existing walls to help prevent any dust from escaping the work area site. Temporary framed walls with 4-millimeter-thick plastic are a great start to control the dust. As a best practice, we also like to provide our jobsites with a HEPA air filtration system to remove airborne dust during construction project. Since you will likely be living in your house during the remodel, you’ll want your HVAC system to be usable during the project. Make sure your contractor takes into consideration any return air grilles that might be located inside the construction zone. Covering or installing a pre-filter helps prevent any dust from getting into the existing duct work and then out into the general areas of the house. During construction it is also a good idea to keep a close eye on the existing HVAC air filters and make sure that they get changed often. These are just a few of the measures needed to be consider in appropriate job site prep. Make sure you talk with your remodeling contractor to confirm that site prep is included in his estimate and that you are comfortable that the basics are covered.